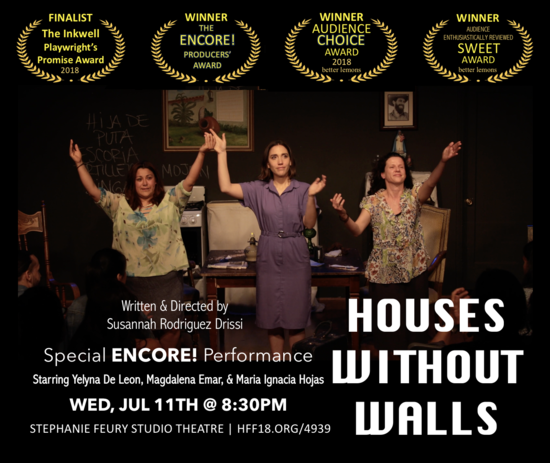 FINALIST of the INKWELL PLAYWRIGHT’S PROMISE AWARD, WINNER of the 2018 ENCORE! PRODUCERS’ AWARD, the BETTER LEMONS AUDIENCE CHOICE AWARD, BETTER LEMONS 100% LEMONADE AWARD & BETTER LEMONS DOUBLESWEET SHOW OF THE WEEK! Praised by national & international scholars, audience, critics, and industry alike, this is a MUST-SEE performance! See PRESS above for ALL reviews. Listen to the playwright’s live radio interview with DJ Jose Cristobal from KXLU 88.9 Alma del Barrio, LMU’s Latin sound since 1973. The interview took place on Saturday, May 26th, 2018, at Loyola Marymount University, Los Angeles, California.